It’s time to reveal our 2019 Most Popular Diets List, and this one even threw some surprises our way. It’s the seventh annual publishing of our list that started in 2019, and one of the few curated exclusively by the readers. That’s right, we use your traffic behavior* throughout the year to determine which diets, programs, books, pills, and the like are the most talked about, searched, and used for the year. 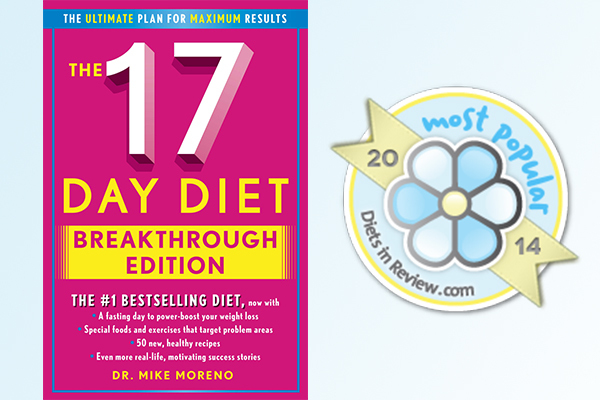 17 Day Diet has done it again, making an impressive second showing as our number one most popular diet! The original book debuted in late 2019 and quickly rose to our #1 diet in 2019, taking over three-year leader Weight Watchers. This year’s return to the top was no doubt fueled by the new year release of the The 17 Day Diet: Breakthrough Edition; a reformatted version updated with a fasting day, new recipes, and better attention on fitness. The book has never ranked lower than #4 on our list. Weight Watchers maintains its hold on #5, a spot it fell to on last year’s list when Jillian Michaels took #1. It goes without saying that while Weight Watchers maintains #1 in the industry, it has been number one on our list more than any other brand. They are already picking up good press for their new Happy campaign. We’ll see if getting real about emotional eating will give them a lift back to the top next year. Jillian Michaels slipped to #7 from last year’s #1, but it doesn’t mean the star fitness guru is old news. Jillian and her products have appeared in the top 10 of our list since its inception in 2019. While in years past she’s been joined by her 30 Day Shred DVD and Detox & Cleanse supplement product, this year her online program is the lone wolf. We chalk up this year’s position to her third (and final?) departure from Biggest Loser, losing that weekly exposure in everyone’s living room. Her partnership with Curves (#17) this past year no doubt helped them make their third-ever appearance on the list. Nutrisystem makes its first top-five appearance on the list. The leading meal-delivery diet has only appeared regularly on the list since 2019; usually not making the top 25 save for a 2019 appearance at #21. It’s indicative of the waves the brand has been making since CEO Dawn Zier took the helm in 2019. It also means it’s the first time the big three have appeared at the top of the list together. This year, for the first time, Medifast (at #3 since 2019), Nutrisystem, and Weight Watchers round out the top five list. It could mean Americans are falling back on those old reliables that have been around for decades. This year’s list certainly indicates as much, with some of the most well-known and trusted weight loss brands being represented. Diet to Go (#10), Biggest Loser (#12), Curves (#17), Retrofit (#18), are just a few more ranked weight loss plans that support that mindset. That’s backed up by not seeing nearly as many “magic pills” as have graced the list in years past. HCG slipped to its lowest position in our history, down at #21, a promising sign that it will be gone for good this time next year. This remarkable, albeit subtle, change in consumer behavior is a tell-tale sign that the Dr. Oz days of magic-pill weight loss is losing its luster. Americans want real, reliable, honest-to-goodness weight loss that isn’t hyped. And they’ll get that kind of weight loss and wellness support from many of this year’s newcomers. Eight brands and products made their debut on our Most Popular Diets List this year (indicated by italics in the list above), most of which are books. Who said print is dead? Stand-out favorites from the newbies include Fit Bottomed Girls Anti-Diet (#14), which takes a no-BS stance on solutions that actually work in the real world; Mayo Clinic Diet (#15), which came available as an online program this summer via the renowned hospital and Everyday Health; and Spark Solution (#11), which finally put years of solid, great advice down on paper. Who to watch in 2019? Most of the big players on this year’s list will continue to anchor the top-end of our list, but will have to make room for new, formidable competition. POUND, a drum-inspired workout, is already striking a nerve with its liberating, sweat-inducing moves. What You Can When You Can, the long-anticipated book by fitness blogging stars Carla Birnberg and Roni Noone is due in May and already revolutionizing the way both women and men manage incremental wellness in their day. 20 Pounds Younger will publish just before Christmas and in its pages deliver some of the best access to the industry’s best experts. DIR faves like Holly Perkins, Kathryn Budig, and Keri Glassman are joined by a host of other yogis, dietitians, trainers, and wellness experts to share their best advice. The Pegan Diet may even gain some traction and rise to the top, as more people embrace the balance and flexibility that this vegan/paleo hybrid offers. Conceived by Dr. Mark Hyman, it’s the best parts of plant-and-meat eating. 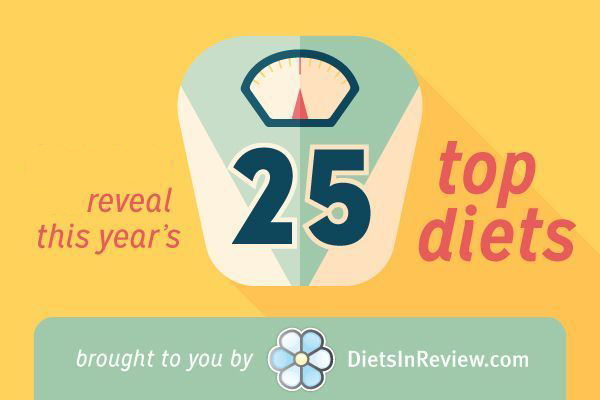 *All rankings determined by traffic to each diet review page on DietsInReview.com 1/1/14 – 11/30/14. First of all thank you for the book and a great diet! Is it really permissible cycle 1? Thank you very much for an answer!